It’s not something we like to think about but motor vehicle accidents happen, people suffer injuries, and the injured either receive treatment at the scene of the accident, or - in critical cases - are taken to a hospital ER. 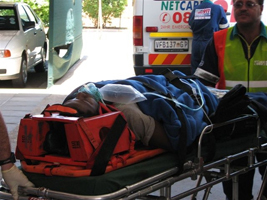 Those fortunate to be on private medical aid are usually taken by private emergency medical services (EMS) which have access to their own network of ambulances, helicopters and fixed wing aircraft. However, all health care providers at the scene of an accident are obliged to treat the injured with immediate effect according to the Patient Rights Charter, the Constitution and the National Health Bill.  Thus, also those without the means to pay for private emergency and evacuation receive these services from private emergency services in practice. By law, no one may be denied emergency medical treatment. What if I’m unconscious and need to be admitted to hospital? Firstly the medical personnel at the scene assess your medical situation and you are stabilised as best possible. 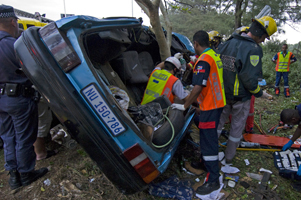 Paramedics will then also try to determine whether you have medical aid and look for identification and medical aid stickers on your vehicle or for a medical aid card on your person. The ambulance will take you to the nearest, most suitable hospital– obviously if you are with a medical scheme chances are better that you end up at private hospital with which your medical scheme has an agreement. People reliant on state healthcare are also often taken to the casualty ward of private hospitals to be stabilised, but those without medical aid are transferred to state hospitals for further treatment, once their condition is stable enough for them to be moved. 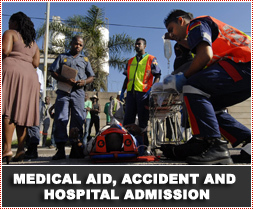 If you are unconscious but identified as being on a medical aid, your treatment will be funded. However, you or your family will still need to apply for a PAR (Pre-authorisation) number usually within two working days being admitted to the hospital when you remain in hospital for further treatment. Pre-authorisation is the prior approval for payment for scheduled surgeries and procedure where hospitalisation is required, so whenever there is hospitalisation involved (ER, triage, scans and casualty ward) confirm with your medical scheme. Have a plan in place so that your spouse or next of kin can take care of all the paperwork; make sure that they have access to the necessary details should you end up in an ICU. Should your doctor or the hospital obtain pre-authorisation, they will receive the scheme's official agreement. Make sure that you get a copy and that you understand the terms and conditions. Note: If you do not apply for authorisation to be in the hospital, no benefits will be payable, or, if you apply late for authorisation you might be liable to pay a penalty fee. In the event of an emergency admission the responsibility still remains with the patient or medical scheme member to get authorisation. Without pre-authorisation, the patient will be admitted and regarded as a private patient. If a request for an increase in length of stay or level of care is denied by the medical scheme, the patient will also revert to a private account. What if I admit myself to a casualty ward? In the case where the injuries do not necessitate transfer by ambulance to hospital and you admit yourself to a private hospital’s casualty ward, medical aid benefits may not always be applicable. Again, check for pre-authorisation and get a PAR number en-route to the hospital or let the hospital staff assist you in obtaining authorisation. Treatment may not be funded from your hospital benefit under certain circumstances. Casualty wards may fall under out-of-hospital benefits, which certain medical aid options (plans) may exclude. You will also need to sign an admission contract at the hospital which makes you or the guarantor liable for any amounts owed to the hospital and not reimbursed by the medical scheme. If you are not on a medical aid, you will need to either admit yourself to a public hospital, or you will need to be able to give a private hospital financial surety that you are able to pay. In an emergency it is a good idea for the hospital to have as much information on hand to make the best possible decision about your treatment. Specific allergies, blood type, religious impacts on treatment, living wills and special medical devices such as pacemakers can easily be documented with electronic devices such as MED-e-KEY by Medic Alert, or Lifecap (a Netcare product), or of course the more traditional Medic Alert bracelet. Electronic information systems such as Google Health, Microsoft HealthVault or Medibook.co.za also offer new avenues of access to electronically stored personal health data, if you have an account with them, but they are relatively new technology. Always have your medical aid card on you, whenever practical.